Experience the beauty of historic St. Augustine and Porpoise Point from the air on this guided helicopter tour. 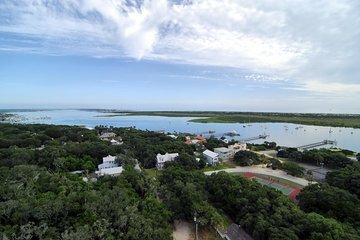 Fly above part of the Intracoastal Waterway and enjoy the breathtaking view of the coastline and North Beach on the flight to Porpoise Point. Take in the panoramic view of the nation’s oldest city, St. Augustine, and the beautiful coastline that borders it on this scenic 16-mile adventure. This 16-mile helicopter tour around Old Downtown St. Augustine and over Porpoise Point begins at the Northeast Florida Regional Airport, four miles north of the city. Take off to the east over the Intracoastal Waterway to North Beach, then enjoy a breathtaking view of the beach and coastline, flying low and fast to Porpoise Point. Cross the St. Augustine Inlet to Anastasia Island and catch a bird’s-eye view of the St. Augustine Light Station at the north end. See the Bridge of Lions, a double-leaf bascule bridge spanning the Intracoastal Waterway; the Castillo de San Marcos, the oldest masonry fort in the United States; Flagler College, a private, four-year liberal arts school and the Nombre de Dios Mission, a Spanish-Catholic mission. Then head west around the south side of town and back north to capture spectacular views of Old Downtown set against a backdrop of the beaches of St. Augustine. I thought it was a little too short....when I went to the airport the tours started at 39.99 and mine was 89. so I thought it might have been just a bit longer especially when I compared it to the 69 flight and choose this.... I really didn't get any info on porpoise point...it was a little too brief.......perhaps just another five minutes would have made it perfect.